Last year I found myself living temporarily smack-bang in the middle of town for a few months. It took me a while to sample the local cafés but as a freelancer I felt obliged to give them all a go. With its bold colours, quirky fittings, delicious cappuccinos and lively staff: Daisy Green emerged as the runaway winner. Perhaps I’m easily impressed but any coffee shop that has the audacity to hang a massive, creepy looking, Cheshire cat from the ceiling is always going to find a place close to my heart. 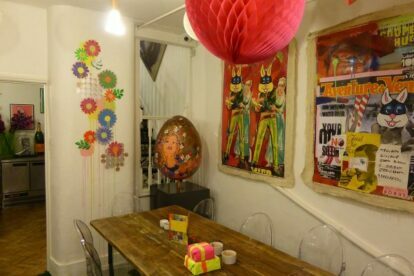 Twinkling fairy lights, AstroTurf carpet, banana deck chairs and saucy pop art complete the café’s colourful décor. Snacks, such as superfood salads and bacon and avocado wraps, are served alongside rich and creamy cappuccinos by energetic baristas who love to have a chat and a joke. Daisy Green is an awesome café. So awesome in fact that one of its taps flows, not with water but, with bubbly Prosecco!